Annie Vincent Interiors: The latest issue of House of Fifty is up! 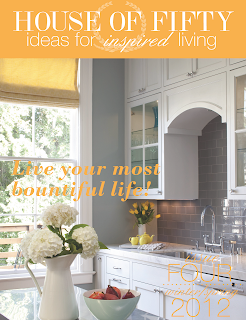 The latest issue of House of Fifty is up! If you haven't heard of the e-zine House of Fifty, you are in for a treat! My friend Janell Beals of Isabella and Max Rooms is the founding editor. You can get it via Ipad/phone, here and even in print! They even have a blog! I am currently using the tips included to put together my living room at my new place. Hopefully, I will have an inspiration board for you soon! One of my favorite items in the current edition is the music mix on pg. 61. Go and take a few minutes to check it out yourself. You will be glad you did! Isn't House of Fifty such a great e-zine? Chalk full of inspiration for sure! I can't wait to see what you do with your living room!